It has been brutally hot in Rome for 15 days; there is no end in sight (well maybe it will be in only the upper 80’s by Tuesday). AccuWeather.com varies the forecast with catchy phrases like “plenty of sunshine” and “blazing sunshine.” The low here tonight is higher than Portland’s forecast high for the day. 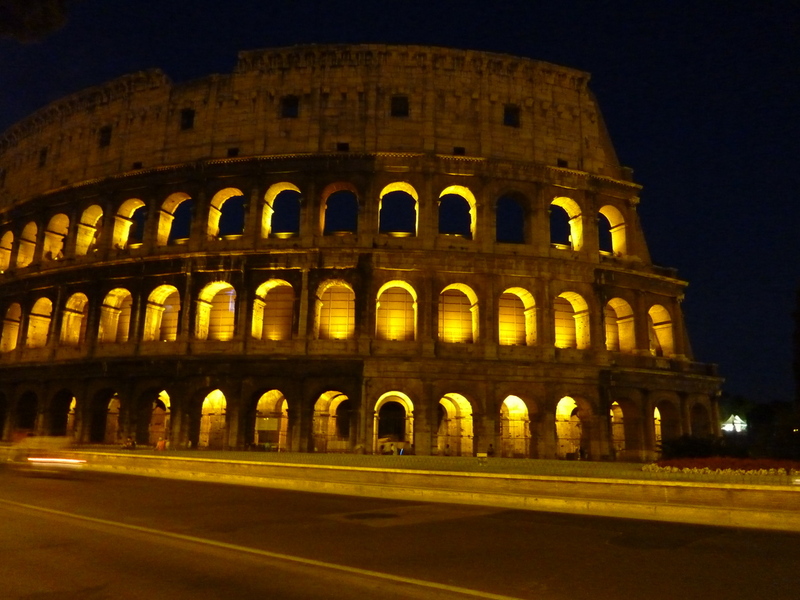 Il Colosseo at night, glows as if lit by torches. But night time is magical and soft. Last Saturday (we are repeating the pattern today) we did our morning shopping, then holed up in air conditioned comfort from Noon until 7:30PM, when we hit the streets. For those who know us, this is aberrant behavior. We were usually on our way home from dinner by 7:30PM in Portland. Rome comes alive about 8:00PM. We headed to a riverside “event” called Lungo il Tevere. This is a street market that runs along the Tiber (Tevere) River for about a mile. It’s a seasonal, semi-permanent installation that occurs every single night until September 2. Some nights the focus is on jazz, on others comedy or the creative arts. So one can return over and over and find something a little different in terms of entertainment. 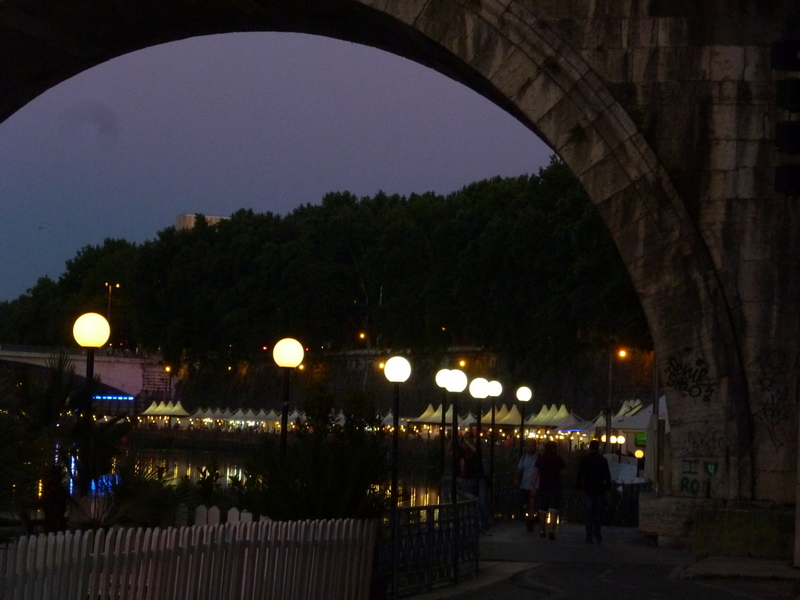 The Tiber is >30 feet below the city, thanks to flood-control walls built in the 1870s. The broad riverside walkway is perfect for the tents, booths and cafes that line it for the summer season. 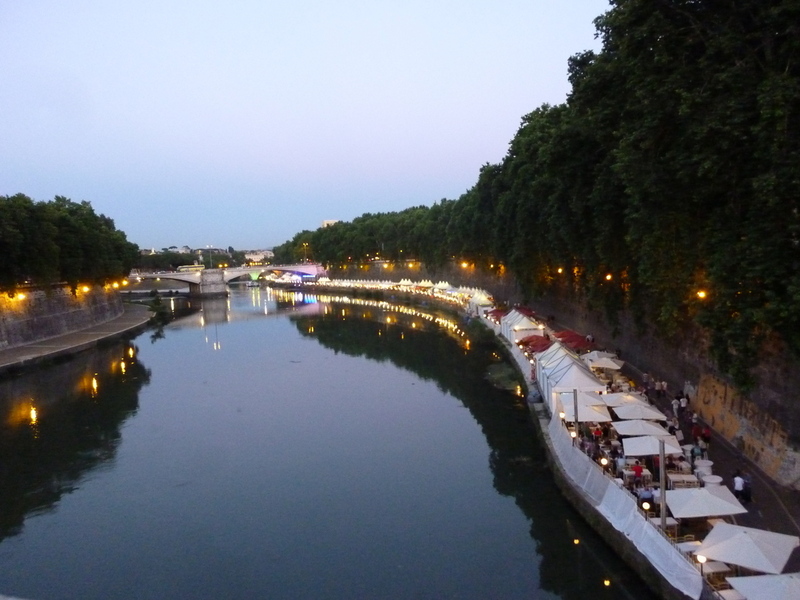 Lungo il Tevere (along the Tiber) summer market, cafe, entertainment venue. Lamplight makes the river walk more romantic. Young and old, singles and families, strolled from booth to booth, café to café, enjoying the night and freedom from being cooped up in apartments. We declined to eat at Lungo il Tevere this time, preferring the Largo di Torre Argentina area and a little place we found last December. 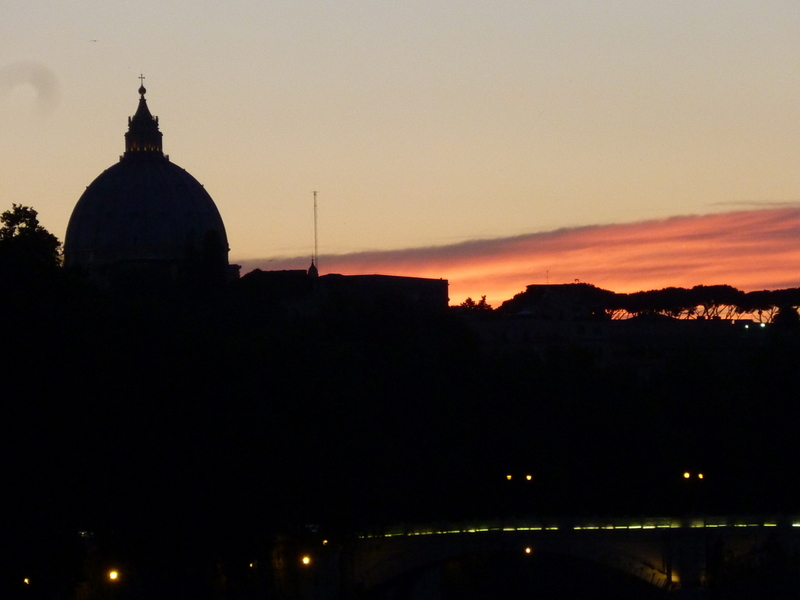 But on our way out, we paused on the bridge to savor a lovely sunset and the dome of St. Peter’s. 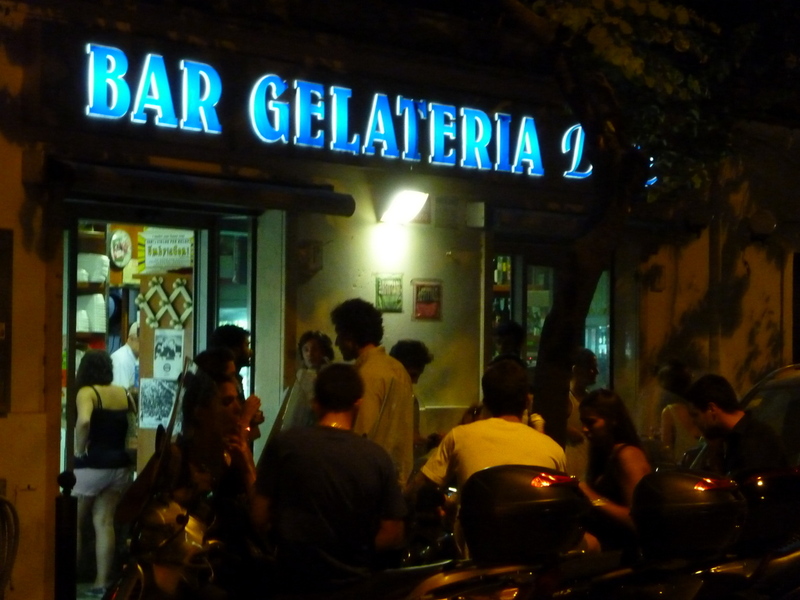 A summer night out in Rome would not be complete without a stop at the neighborhood gelateria. This is the scene a couple of blocks from our apartment at 23:15. And it is like this every night of the week (at least in summer). There seem to be two peak times: around 18:00 for pre-dinner aperitivo and about 23:00. Bar Gelateria Duse has a melon gelato that is to die for! So intense is the fruit that it is practically healthy. This is our go-to place for gelato. Open late! Monuments at night: serene, peaceful, lovely. Even our neighborhood is bathed in gold at night! Goodnight Moon! 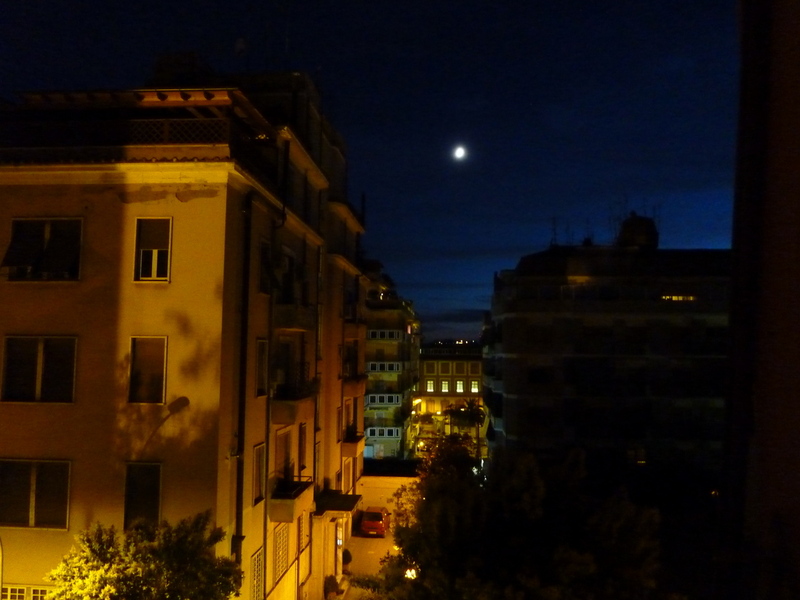 Parioli – view from our window. Thanks for sharing the lovely photos and story. I look forward to reading your posts in the evening. Miss you both but am so happy you are enjoy life as you should. See, being a night person isn’t so bad! 🙂 What wonderful experiences ya’ll are already having! So enjoying hearing about them and seeing the pics. 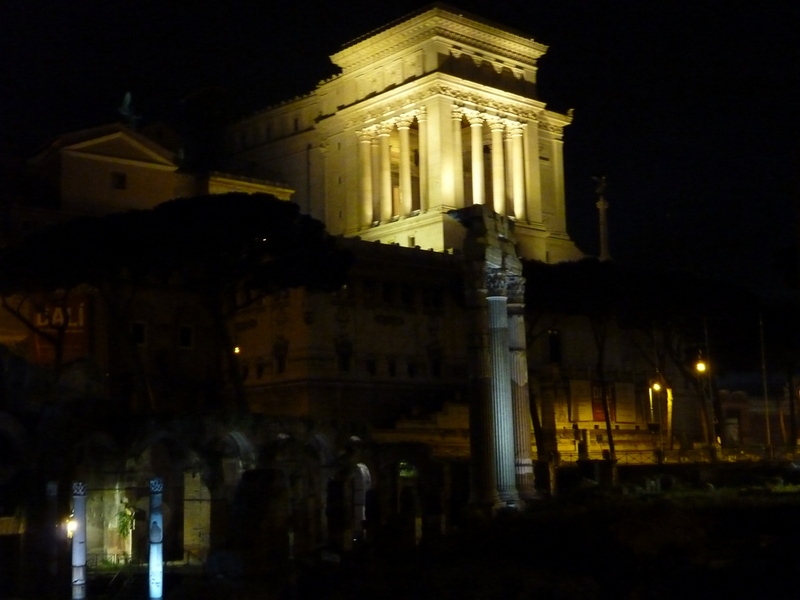 Sounds like Rome is the place to be at night…still raining here. Like that will ever change.. So how’s the new job? Laurel – thanks for taking the time to share the pics and the stories. I look forward to your blog which continues to ignite by desire to return to Italy sooner than later!